Participants at the 7th Transfer Project Workshop held April 2019 in Arusha, Tanzania. Now in its seventh iteration, the Transfer Project workshop has grown from 39 participants in 2010, to over 130 participants in 2019. It is increasingly seen as an important forum where governments exchange and learn about the use of evaluations and evidence produced by UNICEF Innocenti and partners in decision-making processes across the region. A government representative went so far as to say that the impact evaluation report of the Social Cash Transfer Programme was “the bible” for his ministry. The Transfer Project is a collaboration between UNICEF, FAO, UNC Chapel Hill, as well as national governments and local research partners. For over a decade, this multi-organisational research initiative has been producing evidence on the impacts of cash transfers in sub-Saharan Africa, going beyond measuring typical economic outcomes, to find out if and how cash impacts other aspects of people’s lives. The workshop was officially opened by Hon. Dr. Mary Mwanjelwa, Deputy Minister from the Tanzanian President’s Office. This first day focused on long-term poverty reduction by exploring the contentious topic of “graduation” from social protection, the productive impacts of cash transfers, as well as a guest lecture by University of Manchester’s Samuel Hickey who discussed the political economy issues surrounding support for and scale-up of social protection, including critical junctures such as national elections or famine. The second day featured evidence from across the region and spanned various themes, including gender, child labour, and cash plus approaches. Representatives from the hosts, Tanzania’s Social Action Fund, provided an in-depth look at the impacts of Tanzania’s Productive Social Safety Net programme, outlining how cash plus programmes can have a positive impact on young people’s lives. UNICEF Innocenti researchers played a prominent role. Tia Palermo and Amber Peterman presented work on cash transfers and gender (chaired by Lusajo Kajula), while Luisa Natali and Jacob de Hoop presented evidence on cash transfers and children’s productive activities. In addition, collaborative research with Innocenti on impact evaluations in Ethiopia, Ghana, Malawi, Mozambique, Tanzania and Zambia were showcased by national and academic partners. The final day of the workshop delved into methodological approaches on impact evaluation and provided a preview of innovative new programmes in the pipeline from Kenya, Ethiopia, Mali, Burkina Faso, Mozambique and Malawi. 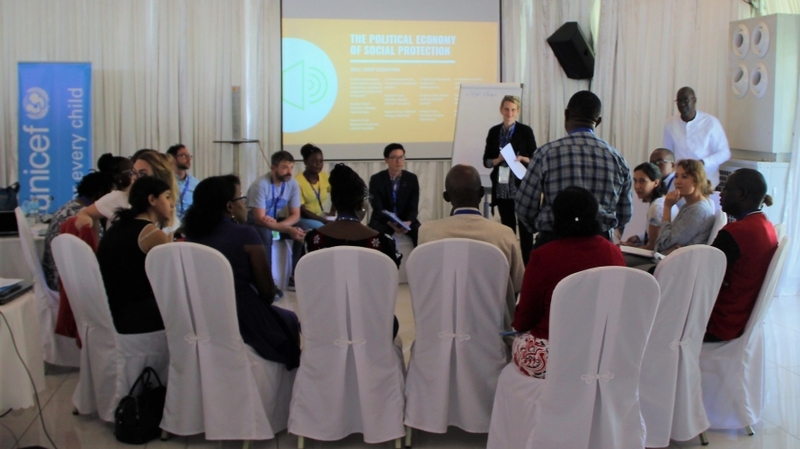 A small group discusses how the political economy influences social protection policies and programmes at the 7th Transfer Project Workshop held April 2019 in Arusha, Tanzania. While garnering the support of stakeholders is indispensable for the implementation and growth of social protection policies, there is also a need to translate the evidence to speak to a wider audience. That’s why this year, the Transfer Project held its first-ever Media Day preceeding the workshop. Supported by the Hewlett Foundation, and in collaboration with UNICEF’s East and Southern Africa Regional Office, the media day hosted 16 journalists and editors from prominent media houses across nine countries in Africa. This one-day crash course in social protection and cash transfers equipped the media with the latest thinking, evidence, and arguments on the case for scaling up social protection instruments. The event also provided an opportunity to discuss the important role the media plays in shaping development policies, as well as identifying what is required from researchers to better cover social protection findings. Read national media coverage on cash transfers following the workshop in The Herald (Zimbabwe). “[Evidence] had a backseat in the way we were doing things, but now I realise that it should be put in the forefront. You cannot create a social protection policy without evidence or evidential support.” – A Government official participant. The workshop concluded with a fascinating session on converting evidence into action, featuring perspectives from donors, government, civil society, national researchers and multi-lateral perspectives. Chaired by Transfer Project co-founder, Ashu Handa, the session gave an unfiltered insight into the challenges of and lessons on evidence-uptake to influence decision-making. As the Transfer Project enters its second decade, research priorities and demands are changing. While evidence on cash transfers in this region can no longer be called ‘novel’, there is still a huge demand for evidence in the region—around graduation, long-term effects, cash plus, systems building and more. It was particularly exciting to see governments presenting the use of evaluations and evidence produced by Innocenti in their decision-making processes. Check out the Transfer Project’s website for all presentations, photos and videos from the workshop. Explore the workshop’s agenda and participants in the right-hand column of this article. See highlights from across the three days in Transfer Project’s Twitter Moment.